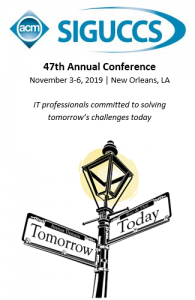 Gather with fellow higher education technology professionals in New Orleans, Louisiana during November 3-6, 2019 to share successes, find inspiration, and connect with colleagues who strive for excellence in providing information technology services for colleges and universities. The ACM SIGUCCS conference is member-driven, and there are many ways to participate. Learn more about ways to get involved. The Call for Proposals for SIGUCCS 2019 is now closed. Conference presentation selections will be announced in early April. Thank you for submitting your proposals. We have several openings on the SIGUCCS 2019 Conference Committee, and we are looking for energetic people to join the team. For current list of available positions, please see the Conference Committee page. Do you have colleagues at your institution who may be interested in presenting at SIGUCCS 2019? Are there peers at neighboring higher education institutions who may benefit from attending SIGUCCS? There are resources at Share SIGUCCS to help you spread the word. Please share the information about the conference!